Paging systems consists of various transmitters as well as receivers. The transmitters are our call buttons, which are water proof and wireless. These call buttons are mountable, and can also be worn on a lanyard. Receivers include wrist watches, computer software and display monitors. There are a range of receivers that each industry can choose from. Doctor’s rooms, hospitals and retirement homes can benefit from using paging systems. I will explain the way each of these businesses will benefit from using the system. Doctor’s rooms should have a paging system in place. This is important to manage the queue at doctor’s waiting rooms efficiently. A button can be placed in the doctor’s room, and a LED light can be placed in the waiting area. The LED light will flash and beep when the doctor presses the button, alerting the next patient that the doctor is ready to see them. Another way that doctor’s rooms can use the paging system is, for the doctor to contact the nurse, if he needs assistance urgently. It is of ultimate importance that every hospital has paging systems in place. The wireless nurse call system is recommended for every hospital. The call buttons can be mounted to the bedside of the patient, as well as be put in the bathrooms and showers. Should the patient slip while having a shower, a call button is easily reachable. The nursing staff can have various receivers. Wrist watch receivers can be worn by the nurses, so they can respond to patients call-requests even while on the move. The wrist-watch that the nurse uses will beep and vibrate, and she will receive notifications immediately when a call button is pressed. Other receivers also include display monitors and LED lights. 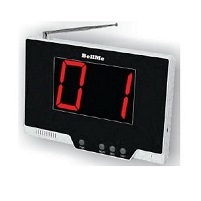 There are different types of display monitors, which will display calling information and they have different settings. Different display and sound settings are available. These monitors can be placed at the nursing stations. A great advantage to having a nurse call system, is the monitoring of response time. The response time of the nurses can be monitored, to ensure that nurses are attending to patients calls on time. Another reason for monitoring response time of the nurses, is management will know which nursing staff members are not productive, and will be able to handle the situation accordingly. Nurses that respond to patient’s calls promptly can also then be acknowledged for their prompt response. LED lights can also be used. These lights can be placed above every patient’s room door. These lights also have different display and sound settings, and can be set to beep or flash, or both when a call button is pressed. Like with hospitals, it is vital that every retirement home has paging systems in place. 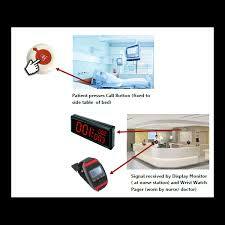 Here too, nurse call systems would be the most ideal product for the elderly and care givers at the old age home. Call buttons can be worn around the neck on a lanyard, ensuring that the resident has it with him all the time in case of a fall. The call buttons can also be mounted to bedsides, showers and bathrooms as well. The same receivers that are used for hospitals can also be used at retirement homes, and monitoring of the response times of the care-givers is optional as well. The hospitality industry has received bad ratings from unhappy customers over the last few months. This is because there is lack of communication between staff and customers. Having paging systems could change the way the hospitality industry does business, ensuring better service and happy clientele. The paging systems can also be used at restaurants. We all have had the experience of going to our favourite restaurant expecting to have a tasty meal and great service, only to find ourselves constantly calling out to waitrons or waving for attention. Having paging systems in place eliminates all the hand-waving and calling out for attention. Restaurants can make use of a system called the waiter call system. This system consists of a three key call button, which is placed on each table at the restaurant. The keypad consists of three buttons. A call button, a bill button and a cancel button. When pressed, the call button will alert the waiter, that a particular table needs assistance. The bill button can be pressed, requesting the bill. The cancel button will be pressed by the waiter when he reaches the table, thus cancelling the call request. Waitrons can use wrist-watch receivers, so that they can respond to patrons while on the move. Display monitors can also be placed in the restaurant kitchen, displaying notifications. With the festive season round the corner, the retail industry will indeed be busy. Supermarkets will find it difficult to manage queues efficiently. Our queue management systems can be used to help with the flow of the queues. The counter paging management system we have available consists of a button that is placed at every till point. The tellers can press this button should they need assistance. Managers can have wrist-watch receivers so that they receive notifications while on the move. As discussed in the article, paging systems are vital to every industry. Having these systems in place will make communication easier and more accessible between clientele and staff members, as well as between employees and the employer. Paging systems are not limited to the industries discussed above; they can be used in any industry.